The following article will draw a metaphor between ancient Polynesians, with limited resources, forced to set out on a journey to find a new home across an uncharted ocean, and ourselves, forced today onto an untrod path leading to a sustainable future on this island. In the book "Guns, Germs, And Steel" author Jared Diamond examines how prehistoric hunter-gatherers, isolated on different continents, separately developed agriculture from the plants and animals at their disposal. He examines each of the major isolated areas of human population, describing the advantages and disadvantages of each. His thesis is that Eurasia, because of its massive size and easily traversed east-west geography, was inevitably the place where the greatest variety of plants and animals evolved, and that this in turn lead to Occidental-Oriental cultural advantages over other peoples that is still prevalent today. The extent of the Eurasian habitat resulted in the longest list of candidate species that might be domesticated. Crucial draft animals such as the horse and ox as well as food sources like the goat, sheep, pig and chicken came from Eurasia. Moreover, crucial species of plants, including wheat and rice were domesticated there and nowhere else. This and much more became a "package" of domesticated plants and animals that were easily spread back and forth across the giant continent. Other places were not so lucky. Because of geography and size, the hunter gatherers of the Americas quickly killed off all major fauna, such as giant dromedaries, sloths and mammoths. This included all whom might later have become draft animals. By chance, Africa had no potential native draft animals either. No one ever successfully domesticated zebras, rhinos or giraffes. Throughout Oceania (including Australia, New Zealand and New Guinea) due to small land masses, there simply were no animals that were big enough to become draft animals. As a result, only Eurasia had the advantage of draft animals for agriculture, and later, for their mechanical advantage in the evolution of industrialized society. Everywhere else people could live pretty well, but not that far from the life of the hunter-gatherer and the farmer. As it turns out, that might not be as bad as it sounds. It may also be what sustainability here will require. Long before agriculture, Oceania was settled by hunter-gatherers who had worked their way across the stepping stone islands between the southeast Eurasian mainland and New Guinea. Agriculture had an independent start in New Guinea. Domesticated plants included bananas, taro, sugarcane, yams and breadfruit. Although New Guinea was not large enough to evolve domesticatable animals, over time interaction with the mainland did introduce the pig, the chicken and the dog. Eventually, the New Guineans explored east to the strings of islands that lead them to Polynesia. Their transportable domesticated plants and animals became the Food Package they carried from island to island. It took almost 500 years for them to reach Samoa. By that time they had become Polynesians. Longer journeys would be needed to reach the distant Polynesian corners of Easter Island and Hawaii. It would take a lot of motivation to embark on such an exploration into the unknown. Perhaps defeat in battle, starvation, or environmental collapse pushed them onward. In any case, for such an adventure the islanders honed and perfected their Polynesian Package. It had to be capable of surviving a long ocean journey and then still take root in a distant foreign soil. Some now know the vegetation of this package by the name "Canoe Plants" (see www.canoeplants.com). There were only twenty-four species among the Canoe Plants. Many of them were food plants but several were used for other purposes such as medicinals, herbs, textiles, oils, building materials, etc. Many of the plants played multiple roles. The Canoe Plants might not have been the ideal plants to have on an newly discovered tropical island, but they were at hand and had proved they could withstand the long difficult journey. We are facing a journey as daunting as that faced by the first Polynesians who left the Marquises Islands for Hawaii. They headed north into uncharted waters about fifteen-hundred years ago with their Polynesian Package. The journey we face is not across an immense ocean, but across a time of social upheaval leading to a different way of living on this planet. There is no option not to change - just a question of how we do it. Some won't prepare and will perish along the way. Others will meet violent storms and lose their way. Being prepared and being lucky will determine our outcome. We can only hope that we too will end our journey in a tropical paradise. A generation ago, at the height of the OPEC oil crisis, people were killing each other over their position on gas lines. There was a movement by people alarmed by America's vulnerability, and concerned with the breakdown of our culture. Their reaction to the situation lead them to become Survivalists. They were characterized as kooks and iconoclasts. Some moved to wilderness areas of Montana. But filling a cabin with a hundred pound bag of rice, a few Krugerrands and a hunting rifle won't get us to where we need to go. The Survivalists were like canaries in a coal mine. They were definitely on to something, but interpreted it through a very personal lens. They acted as individuals, not as a community. If we all had all followed their course not much would be left of what we call civilized society. The trick for us is to "power down" our consumption based economy while preserving what is important of our culture. This will require a community effort. 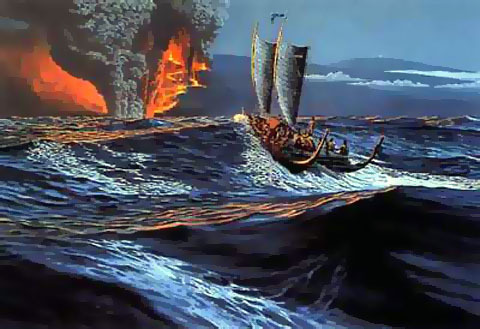 The Polynesians had limited space and weight for things that they might take on their canoes across an unknown ocean. They had to pick carefully what might be included for the trip in their canoes. We will have analogous limitations as to what we will be able to bring along into the future. Instead of space and weight, we will be limited by capital and energy. Both capital and energy are going to diminish soon and we cannot waste much of either. When the Polynesians packed their canoes it had to be with resources already available too them. What they packed had to survive the trip and be viable for starting a new life in a different world. Also, what they took on board was the only resource they had for surviving the journey itself. On our journey we will similarly have to work with what is actually available and make do with it until we arrive at some balance with the world that is sustainable. We must invest in solutions to carry us into that future. We will have to choose our New Polnesian Package carefully, as there won't be unlimited resources to waste. We need to prioritize possibilities and make decisions about what to include for our journey. As American Imperialism collapses, the "Package" we begin with will be all we can rely on once we leave the shore of U.S. Consumerism. • Iceland has committed to a hydrogen economy based on geothermal energy, and to be free of fossil fuels within 50 years. • Sweden made a decision to go nuclear and to wean itself from oil dependency in 15 years. • Abu Dhabi plans to be expert in solar energy, photovoltaics, energy storage and carbon sequestration within a decade. • New Zealand has committed to being carbon neutral in half a dozen of its government departments within 5 years. Where is Hawaii in all this? Not very far along. Last year a Hawaii 2050 Sustainability Task Force was set up by the State Legislature. Its initial kickoff was worthy, but its goals were eviscerated by Governor Lingle and those worried about 2050 Task Force efforts interfering with economic growth.